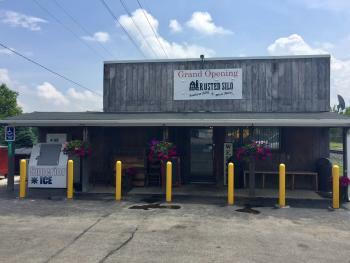 Up in northwest Hendricks County, in the quiet little town of Lizton, Indiana, just off I-74 between Crawfordsville and Indianapolis, there is a new barbecue joint that I&apos;ve been excitedly waiting for since January. At long last, the Rusted Silo Southern BBQ & Brew House opened in April, so I made my way up there to check it out. I lived in Texas for 10 years, and while residing in the Lone Star State, I developed quite a fondness for southern barbecue. Nothing beat the Aggie Special at now-closed Tom&apos;s BBQ in College Station, Texas -- a long-time staple for students at Texas A&M University. In addition to the excellent food, Tom&apos;s BBQ featured tin walls with rustic wood trim, so when I walked into the Rusted Silo for the first time, the smell of barbecue and the sight of the tin and rustic wood inside took me straight back to my college days. I went up to the counter and noticed that the available meats were hand-written on butcher paper on the wall. The Aggie Special was served on butcher paper back in the day, so I was impressed by the attention to detail. 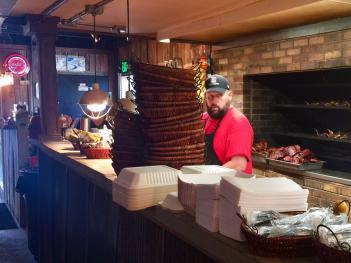 There was so much meat to choose from -- pulled pork, ribs, chicken, and more -- and I could see it all rotating on a giant custom-made rotisserie right next to the menu on the wall. Fortunately, I was saved by the young lady at the counter who, upon learning that this was my first trip to the Rusted Silo, suggested the lunch special that day: a pound-and-a-half of baby back ribs, cole slaw, Texas Toast, and a drink for $10. Sign me up! I got my order number, grabbed a cup of freshly-made sweet tea, sat down at a table, and watched as owner Rob Ecker pulled my ribs off of the meat ferris wheel and prepared my lunch. Rob hails from Florida and spent many years as a Walt Disney chef in Paris and in Orlando after graduating from culinary school in the early 1990s. While he has over two decades of experience cooking at upscale restaurants, it&apos;s his childhood love of cooking out that led him to open the Rusted Silo with his wife, Tina. The tin and wood within the Rusted Silo come from an old barn in Frankfort, Indiana, and the ambiance of the place is definitely southern. The meat comes from a variety of local producers, which I really like, and with Rob hailing from the South, he nails the southern barbecue experience. It didn&apos;t take long for Rob to call my number, and when I went up to the counter to retrieve my lunch, I guess I hadn&apos;t taken the time to imagine what a pound-and-a-half of ribs would look like. My mouth fell open at the sight of my basket and the weight of it when I picked it up. Scurrying back to my table, I dove right in to the ribs. They were outstanding. They had a tangy and smoky flavor that took me straight back to Texas. With sauce all over my fingers and face, I was thankful for the hearty napkins on the table. After finishing my first rack, I tried the cole slaw. It was just the way I like it -- crunchy, not soggy, and with the flavor of the dressing, but not drowning in it. The Texas Toast was perfectly crunchy, too. Finishing the second rack of ribs was not an easy task, but I did it because that&apos;s how good they were. The woman who took my order came around and checked on me periodically, and she was very friendly and attentive. I had run over to the Rusted Silo from McCloud Nature Park while on my lunch break, so I stuck with the sweet tea. I figured it would be frowned upon for me to show up at the office with beer on my breath after lunch. But Rob has experience as a microbrewer, so it&apos;s no surprise that the Rusted Silo offers a slew of craft beers from Indiana, Michigan and Kentucky, including some of Rob&apos;s own recipes. A return trip is definitely in order to try some of those tasty brews. As if the Rusted Silo wasn&apos;t cool enough already, they fully compensate their employees, so the tips that are left by customers go into the Rusted Silo Fund to be used for scholarships and for an emergency fund for those in need. Excellent southern barbecue, huge portions, reasonable prices, craft beers, great ambiance, friendly service, local meats and owners who give back to the community. You can&apos;t go wrong with the Rusted Silo. Open Monday through Saturday, 11 a.m. to 9 p.m.